WAN links and the routers that serve them are usually the most expensive part of the network, and managing bandwidth allocation can be complex. Over-subscribing to bandwidth could mean that the company is paying for more bandwidth than required and under-subscribing could result in congestion and unacceptable network performance. WAN Monitoring and Router Monitoring thus become very critical to not just day-to-day productivity but also to a company's bottom-line. Network managers will need to optimize the quality of service by balancing throughput, committed information rate (CIR) and burst rate with congestion, response time, and discards. 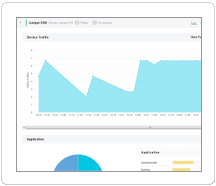 Some of the WAN monitoring challenges include optimizing bandwidth allocations, ensuring high network availability, quickly resolving WAN problems, capacity planning for future requirements, minimizing recurring costs on WAN links, identifying high traffic/ utilization sources and spotting & updating problematic legacy routers. 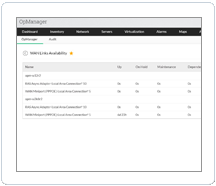 "With its rich web-based interfaces, OpManager offers pretty advanced network management functionality and at a compelling price-point, making our decision to select OpManager, all the more easier. We look forward to building upon our Network infrastructure with OpManager at the core of providing a secure and resilient management solution." 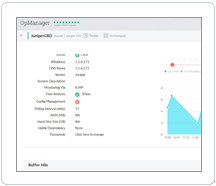 OpManager monitors your WAN links' bandwidth, utilization, errors, discards and thus helps you verify Service Level Agreements (SLAs) with your Internet Service Providers (ISPs). By presenting accurate information on traffic and utilization for every link in your WAN, you can identify highly utilized and under-utilized links allowing you to optimize bandwidth allocation across links. By proactively monitoring link latency & link errors and assigning threshold alerts to these, you can identify degradations early and avoid costly downtime. And what's worse than your links going down? Not knowing that they are! OpManager alerts you whenever a link goes down. Alerts can be sent as Emails or text messages which contain details on thresholds breached and relevant link details eg. the "circuit ID" which allow the Administrator to quickly pinpoint unavailable links. OpManager's reporting functionality also provides you with a detailed availability report of all your interfaces. You can use these reports to cross-check whether your SLAs are being met. With OpManager you can create business views (maps) to graphically visualize your entire WAN. You now gain complete visibility on your WAN links and track outages to the hop level. Apart from your infrastructure, WAN performance depends very much on the ISPs you subscribe to for the WAN service. 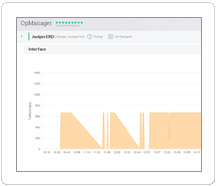 OpManager provides insights on your WAN link performance by displaying hop-wise latency count from which you can identify whether the problem resides in your infrastructure or with the ISP's. OpManager helps network managers save on monthly recurring costs by identifying under-utilized links. Armed with historical traffic trend charts and link utilization reports, network managers can also plan for additional capacity well in advance. If you are seeing abnormally high traffic / utilization, you can now find out why. 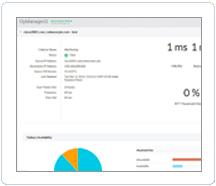 Get detailed traffic analysis in OpManager by integrating it with ManageEngine NetFlow Analyzer. Know which users or applications are using your bandwidth and see who the top talkers are. 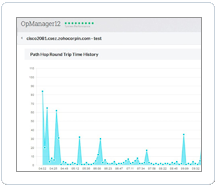 OpManager helps you to quickly identify unusual behavior/performance in your routers and logs these as events. You can now list down troublesome routers which need upgrade/update/replacement. You can also push any change or configuration to multiple routers easily by integrating OpManager with ManageEngine DeviceExpert.